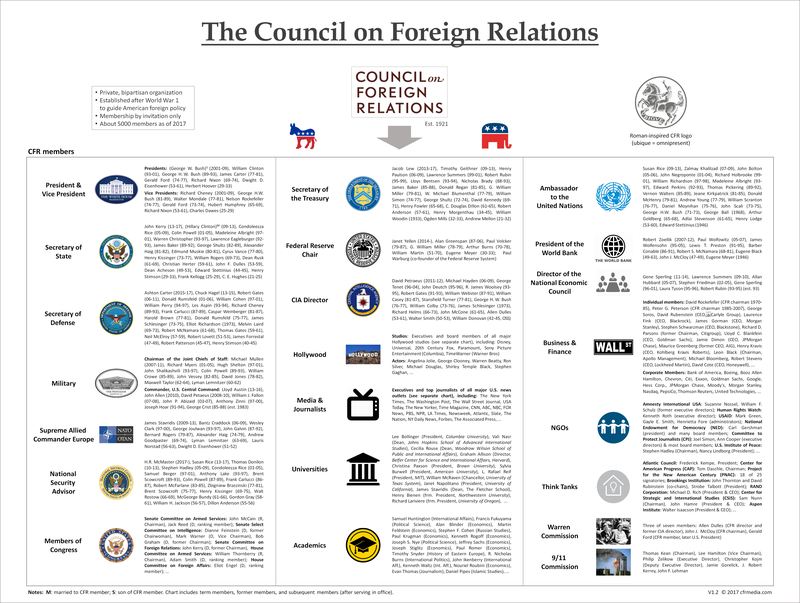 Established in 1921 as a private, bipartisan organization to “awaken America to its worldwide responsi­bilities”, the CFR and its close to 5000 elite members for decades have shaped US foreign policy and public discourse about it. As a well-known Council member famously explained, they transformed the American republic into a global empire, albeit a “bene­volent” one. 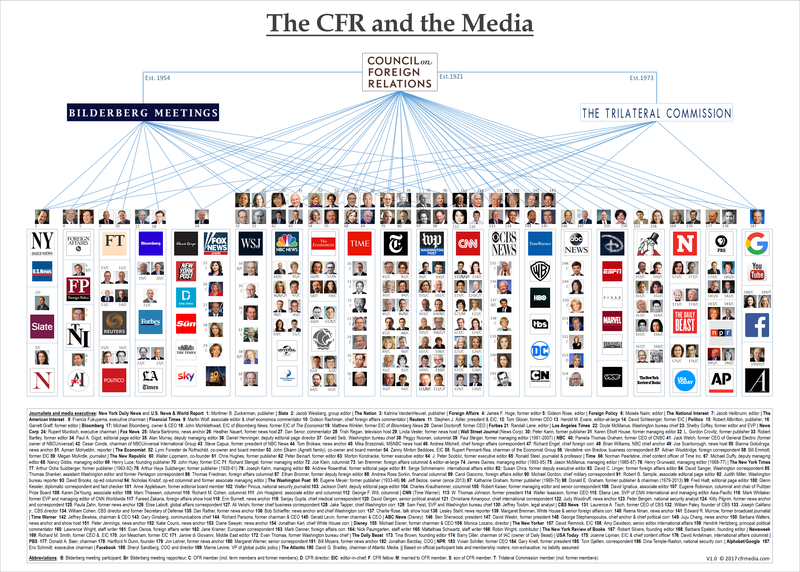 Based on official membership rosters, the following illustration depicts for the first time the extensive media network of the CFR and its two major international affiliate organizations: the Bilderberg Group (covering the US and Europe) and the Trilateral Commission (covering North America, Europe and East Asia), both established by Council leaders to foster elite cooperation at the international level. In a column entitled “Ruling Class Journalists”, former Washington Post senior editor and ombudsman Richard Harwood described the Council and its members approvingly as “the nearest thing we have to a ruling establishment in the United States”. German news magazine Der Spiegel once described the CFR as the “most influential private institution of the United States and the Western world” and a “politburo of capitalism”. Both the Roman-inspired logo of the Council (top right in the illustration above), as well as its slogan (ubique – omnipresent), appear to emphasize this ambition. Until recently, this assessment indeed was justified. Thus, in 1993 former CFR director George H.W. Bush was followed by CFR member Bill Clinton, who in turn was followed by CFR “family member” George W. Bush. In 2008, CFR member John McCain lost against CFR candidate of choice, Barack Obama, who received the names of his entire Cabinet already one month prior to his election by CFR Senior Fellow (and Citigroup banker) Michael Froman. Froman later negotiated the TPP and TTIP trade agreements, before returning to the CFR as a Distinguished Fellow.